A core problem for both Founders and VC’s is that finding each other takes too much damn time. Too many meetings, too many emails, too much driving around. In the industry focused on disrupting every other industry, the core industry operations have not changed in decades. Series A companies are often meeting with 25+ investors. Individual VC investors are regularly seeing 800+ companies per year and meeting with 300+. Further, the very best or second-time founders often take money from people they know, or the people they had dinner with last night. It’s nearly random. Fellow Founders and VC’s don’t always realize how medieval this is, because that’s how it’s always been done. People just jump in and do what everyone else is doing. Founders call it “fundraising.” VC’s see it from their side and call it “sourcing.” Our networks, these relationships, are all around us. We just can’t see them easily. They’re invisible and not actionable. The way our funding ecosystem operates is medieval. Where’s the software? As co-founders of 10+ startups and also investors in over 250 companies, we feel the time drain acutely, from both sides. Having built networks of this kind before, we know the pain we could avoid if we can just get the software and community right. Fundraising/sourcing should be like recruiting with LinkedIn, finding a real estate agent on Trulia, or dating with Match.com. Prior to these software platforms, those processes used to be horrible. We want the fundraising/sourcing process to enjoy the same transformation. The status quo of VC fundraising is not OK. We can do better. And other VCs agree. Great investors from Greylock, CRV, Mayfield, Shasta, and many other firms have been working with us since last year to build a tool to help transform the fundraising process. That tool is called Signal. 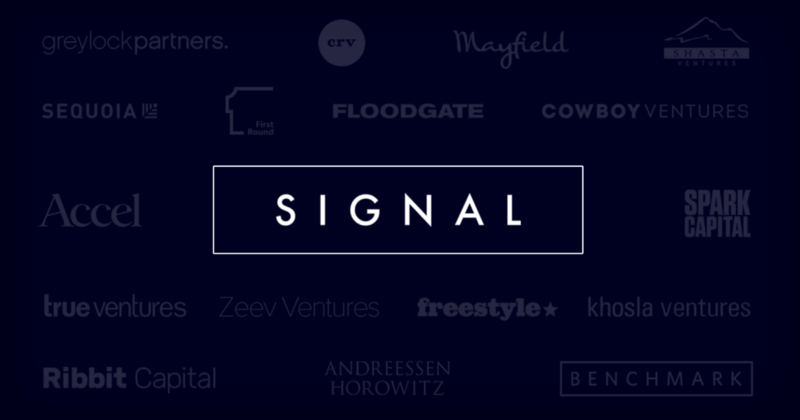 Signal is a free tool to make the Founder-VC network visible and actionable. Thousands of VC’s have edited their profiles and connected their networks. Signal helps you get the intros you need to the right VC’s. It allows you to privately make your invisible network visible. Let’s you track your progress in building that network, and lets you see the outcome of each connection you make. Your Founder-VC network becomes an asset for you, speeding up your process. There are now over 3+ million graph connections between top Founders and top VC’s. Using Signal is the “software phase” where you use the network to intelligently shorten your list of prospects and get the intros to the right people. Of course, this is still a people business, so the next phase should be to meet. But by using software and structured data at first, both sides should be able to have better results with fewer meetings and less time. Privacy and control for top founders. Yes, others have tried building software around this challenge in the past, but it was only for very early stage companies only and was not used by the top founders or top VC’s. Signal is designed for the most desirable founders to use because it flips the model by giving them privacy and control from the beginning. 1. Connect your Gmail accounts (personal and professional) to reveal your intros paths into the Founder-VC network. 2. Grow your Signal network by adding your co-founders, friends, other CEO’s and VC’s. When you join with your Gmail accounts, your Founder-VC network grows. 3. Use The VC Lists feature to find specific VCs (not just firms) who invest in your stage/sector. VCs use VC Lists to broadcast the types of deals they are looking for. 4. Edit everything. Complete your public profile if you’re a VC or build your private company page if you’re a Founder. Upvote the best VC’s. Edit VC profiles (yes, you can do that). Invite more people to connect with you. Build a Target VC list. All of these actions increase your visibility in the network and the quality of connections you can make. As software entrepreneurs ourselves, we are wired to build software to solve problems that we see. As investors we like to collaborate with other great investors and help them find the deals that are a fit for them. Signal helps everyone, and it’s our first contribution. We take a very long term perspective on Signal’s development. We’ve staffed up a significant engineering team. The software is free and always will be, it’s just something that needs to happen for our industry. Our team will constantly be talking both Founders and VC’s to see how the software can benefit them, so please reach out. Software has streamlined other industries to great benefit in the last 25 years. We think it’s inevitable that it will also happen in our tech ecosystem. In the future, Founders will have 25 meetings for their seed rounds instead of 75. Series A’s will have 10 meetings instead of 25. VC’s will spend a few hours per day reviewing companies online. They will be able to review 1400 companies per year not 800, but only have 150 meetings to get better results. Founders will get better feedback faster and evolve to stronger companies faster. Today we’re adding new features, including The VC Lists which is particularly useful and actionable for founders to find the right VC’s for their sector and stage, and for VC’s to broadcast what investments they are looking for. We’re also adding a feature to “Upvote” VC’s in order to reveal online the informal recommendations that happen between Founders. This will help all great investors standout, regardless of stage or firm. Top Founders and VC’s are welcome to join - https://signal.nfx.com. 7. Getting helpful feedback and more concrete answers from VC’s you meet even if they say no. 7. Not getting constructive feedback on your reputation and service performance.